the weather outside is frightful. truly it is. temperatures have been in the single digits and the wind chill has been below zero! january is here and the weather is numbing. cold days call for warm and hearty comfort food. when i think of comfort food, one of the things that comes to mind is shepherd's pie. 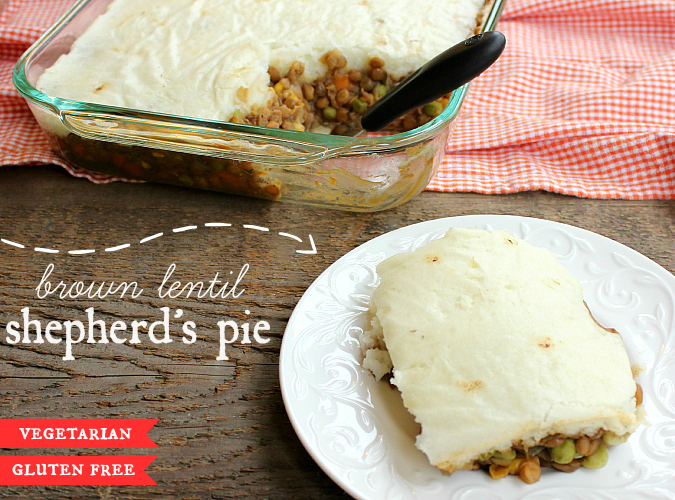 i was delighted when i found a recipe for a vegetarian version of shepherd's pie. brown lentils take the place of traditional ground beef. the lentils are packed full of nutrients and protein. they are also inexpensive and cook up in no time. that's a win-win. 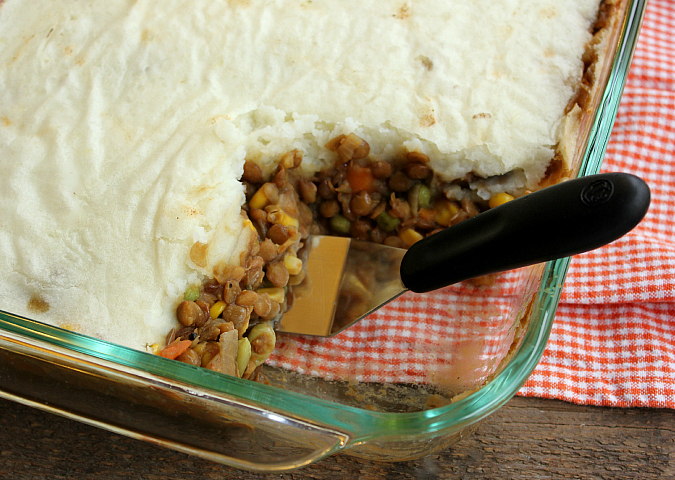 the lentils come together with mixed vegetables and everything is covered in a layer of fluffy mashed potatoes. yum! this vegetarian-friendly shepherd's pie is both hearty and filling. it's going to be a staple in our house this winter for sure. peel and dice the potatoes, then place them in a large pot filled with water (so that the potatoes are covered). bring the water to a boil and cook for 15-20 minutes until the potatoes are tender. drain the water and add the butter and cream to the potatoes. beat with an electric hand mixer until smooth. season with salt and pepper to taste. while the potatoes are cooking, preheat your oven to 425 degrees F and lightly grease a 9x13 inch baking dish. in a large soup pot over medium heat, saute the onions and garlic in olive oil until translucent. add the lentils, stock, and thyme. bring to a boil, then reduce the heat and allow the mixture to simmer until the lentils are tender (about 35-40 minutes). stir in the frozen vegetables. scoop out 1/4 cup of the liquid and whisk it into the cornstarch. return it to the pot to thicken the mixture. season with salt and pepper to taste. pour the mixture into the baking dish and evenly spread the mashed potatoes on top of the mixture. place the baking dish on a large baking sheet and bake for 10-15 minutes until the mashed potatoes are lightly browned on top. I love shepherd's pie! I will definitely have to give this recipe a try. Thanks for sharing. That looks tasty. You can put some many different things in shepherd's pie. Great to take for lunches too.